Is the day of the airplane which will be piloted by pushing a button almost here? A new gyroscopic control keeps an airplane on an even keel and on a predetermined course more accurately than the most experienced human pilot. 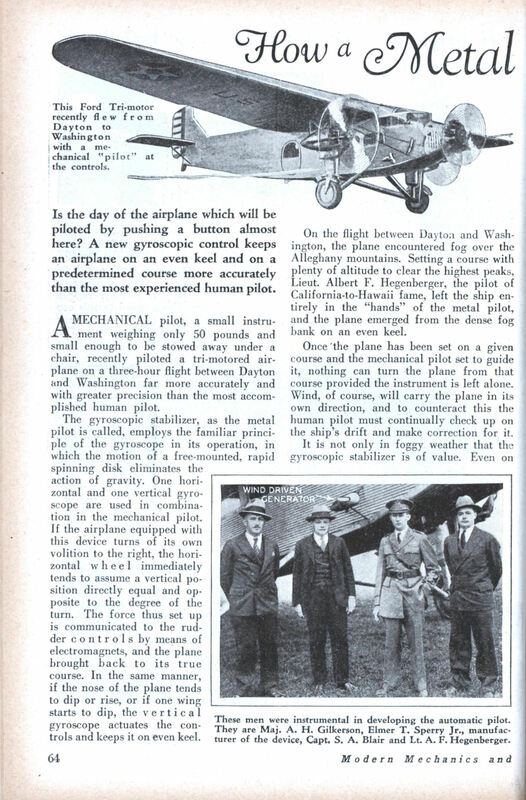 A MECHANICAL pilot, a small instrument weighing only 50 pounds and small enough to be stowed away under a chair, recently piloted a tri-motored airplane on a three-hour flight between Dayton and Washington far more accurately and with greater precision than the most accomplished human pilot. The gyroscopic stabilizer, as the metal pilot is called, employs the familiar principle of the gyroscope in its operation, in which the motion of a free-mounted, rapid spinning disk eliminates the action of gravity. One horizontal and one vertical gyroscope are used in combination in the mechanical pilot. If the airplane equipped with this device turns of its own volition to the right, the horizontal wheel immediately tends to assume a vertical position directly equal and opposite to the degree of the turn. The force thus set up is communicated to the rudder controls by means of electromagnets, and the plane brought back to its true course. In the same manner, if the nose of the plane tends to dip or rise, or if one wing starts to dip, the vertical gyroscope actuates the controls and keeps it on even keel. On the flight between Dayton and Washington, the plane encountered fog over the Alleghany mountains. Setting a course with plenty of altitude to clear the highest peaks, Lieut. Albert F. Hegenberger, the pilot of California-to-Hawaii fame, left the ship entirely in the “hands” of the metal pilot, and the plane emerged from the dense fog bank on an even keel. Once the plane has been set on a given course and the mechanical pilot set to guide it, nothing can turn the plane from that course provided the instrument is left alone. Wind, of course, will carry the plane in its own direction, and to counteract this the human pilot must continually check up on the ship’s drift and make correction for it. It is not only in foggy weather that the gyroscopic stabilizer is of value. Even on clear days cross-country flying puts more or less strain on the pilot, reducing his efficiency. Even though the pilot’s attention is divided among innumerable instruments, long flights are likely to be tedious at best. The gyroscopic control maintains an automatic watch over the three axes on which an airplane moves, freeing the pilot for the more important task of navigation. The gyroscopes of the automatic pilot revolve at a speed of 15,000 r.p.m. 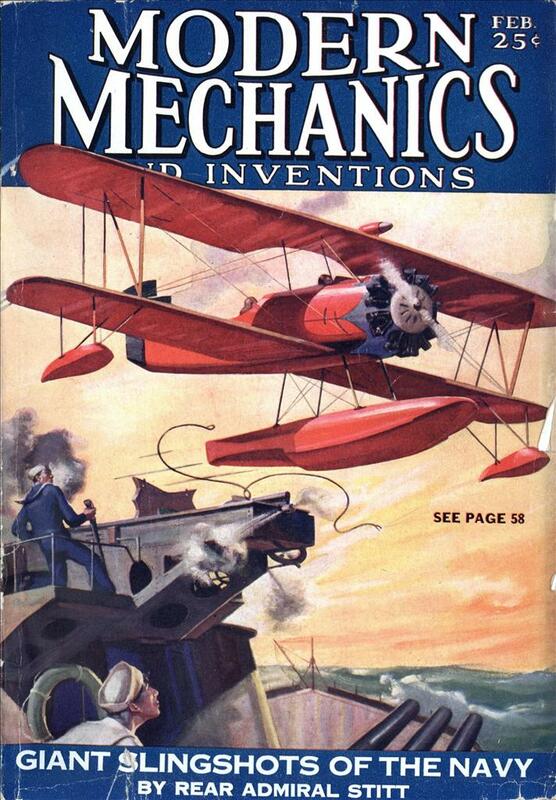 Early electromechanical autopilot, cool, but the title made me think it was a story about the grandfather of Otto the Autopilot from Airplane.